The Parker Flex-It™ stylet can be used in two different ways. 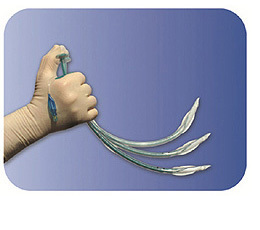 The unique Flex-It Stylet™ allows for selecting and setting the curvature prior to the intubation. During intubation, the thumb control can be used to change the angle of the tube; a press on the thumb control lifts the tip of the endotracheal tube. The thumb control allows for continuous variations during intubation. The Flex-It Stylet is suitable for both oral and nasal intubations procedures.